He insisted on playing Muslim music instead. A Florida man doesn't want his Big Mac with a side of gospel. According to The Smoking Gun, 46-year-old Joseph Allen was arrested at McDonald’s today following a bizarre rant. According to the police report from the Largo Police Department, Allen went into the restaurant at around 10:20a.m. 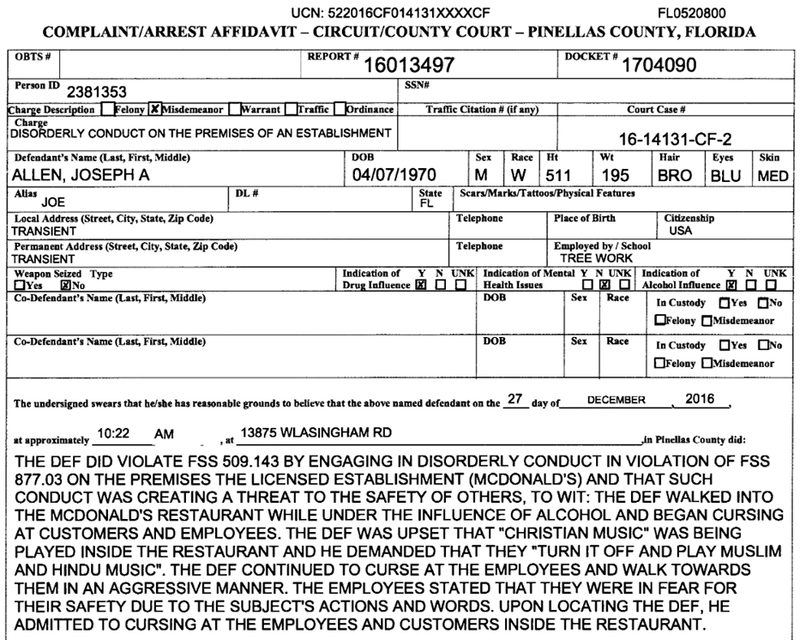 today and he “began cursing at customers and employees” due to the “Christian music” being played. Allen demanded that employees “turn it off and play Muslim and Hindu music." Someone made a 911 call following the rant. Allen admitted to cursing out workers and customers. Following a search, police found a bag of methamphetamine in his pants pocket. Shocker. Allen was arrested and booked for disorderly conduct and narcotics possession charges. A career criminal, Allen has a rap sheet that includes assault; robbery, grand theft, and carrying a concealed weapon. He is currently being held in lieu of a $2150 bond.